Tata Motors is offering huge discounts on its range of Nano cars. The discounts range from Rs. 80,000 for the regular model and Rs. 35,000 for the Twist and eMAX CNG models. The problems with Tata Nano persisted right from its launch. Firstly the transfer of its factory and later the fire issues made things difficult for Nano. Also the build quality and the engine noise issues worsend the problems for the car. 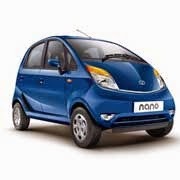 Tata Motors has worked hard to revive the brand name Nano. They bought in lot of changes in the interior as well as exterior to make the car more valuable. Addition of a power steering was a good move, however the sales of the car did not pick up even then. Tata Motors sold just 1,654 units of Nano in October 2014 as compared to 2,120 units in the same month last year. Upcoming additions like automatic transmission, bigger fuel tank and openable rear tailgate give some hope of the car. As of now its the best time to buy a Nano car. If you are planning, just go and buy one.